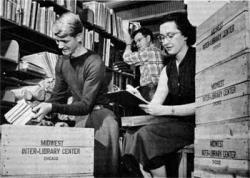 In March 1949, ten major U.S. universities entered into a formal agreement to establish the Midwest Inter-Library Corporation (MILC), the forerunner of today’s Center for Research Libraries. The founding institutions were the University of Chicago, the Illinois Institute of Technology, the University of Illinois, the State University of Iowa, Indiana University, the University of Kansas, Michigan State College, the University of Minnesota, Northwestern University, and Purdue University. Ralph T. Esterquest became the Center’s first director in July 1949. The officers of MILC established the “cooperative interlibrary center” with an initial grant of $750,000 from the Carnegie Corporation of New York. 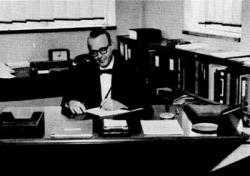 In July 1949, Ralph T. Esterquest, assistant director of the University of Denver Library, was appointed the Center’s first director. The operations of the center were supported by assessments of each member university, the assessment being indexed to the university library's purchasing budget and the current size of its Ph.D. program. Initially the Center’s chief activity was accepting and processing deposits of monographs, journals, and other materials that were transferred to it by member universities. The present collection of more than 5 million items originated with deposits of research materials from the founding members, which were supplemented over the decades to maintain the strengths of the original collection areas. Early deposits consisted of a variety of materials, most of which were materials that, although infrequently used, were considered worth preserving for historical purposes. The early deposits included college textbooks and catalogs, dissertations, and state documents. Materials also included scientific monographs and the proceedings of American and European scientific and learned societies; medical handbooks and texts that no longer reflected current practice; political and ideological books and newspapers from the fascist period between the two World Wars; and non-current but voluminous industrial and trade journals. In addition to accepting deposits, the Center also began to subscribe to U.S. and foreign newspaper titles not being acquired by members, thus establishing a collection that is one of its enduring strengths. In 1952 the Center expanded this cooperative acquisitions program to actively acquire state government and legal documents from various U.S. jurisdictions. The following year the Center assumed responsibility for subscriptions to approximately 300 serials, releasing member libraries from the cost of supporting infrequently used titles, and began to systematically acquire documents issued by governments outside the United States, with priority given to governments in the Middle East and South Asia. CRL subsequently established additional collections, typically ones in which materials tended to be costly, such as microform collections; required critical language skills to catalog, such as Middle Eastern and South Asian materials; or were difficult to obtain, such as dissertations from non-U.S. universities and political ephemera from developing regions. 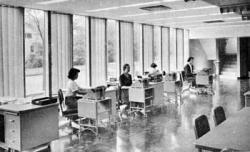 In the early 1960s, the Midwest Inter-Library Center expended from a regional, Midwestern organization to one of national scope. Under director Gordon Williams’ leadership, the Center provided a home for national preservatopn and collection development efforts, such as the Foreign Newspapers (microfilming) Project of the Association of Research Libraries, and the National Science Foundation’s Scientific Journals Center. The Center opened its membership to universities outside the Midwest, and by 1971 its numbers had grown from the original ten to 66 universities. 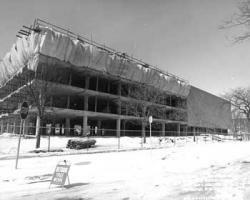 Construction on the current home of CRL in 1993. Today CRL is a consortium that numbers more than 200 members. These are chiefly U.S. and Canadian universities and colleges that emphasize original research in the humanities, sciences, and social sciences. Members range from private universities including Harvard and Stanford, state universities including the University of Illinois and North Carolina State, and four-year liberal arts colleges including Oberlin and Colorado College. The Center’s most distant member is the University of Hong Kong.